Packing to drive north for Beauly and Cannich, I took my ancient Ordnance Survey map with me, bought for three shillings in the 1930s. I was an eager youngster then and had hatched a plan to camp at Benula beneath Lochs Mullardoch and Lungard, and reap the harvest of the highest summits north of the Great Glen. 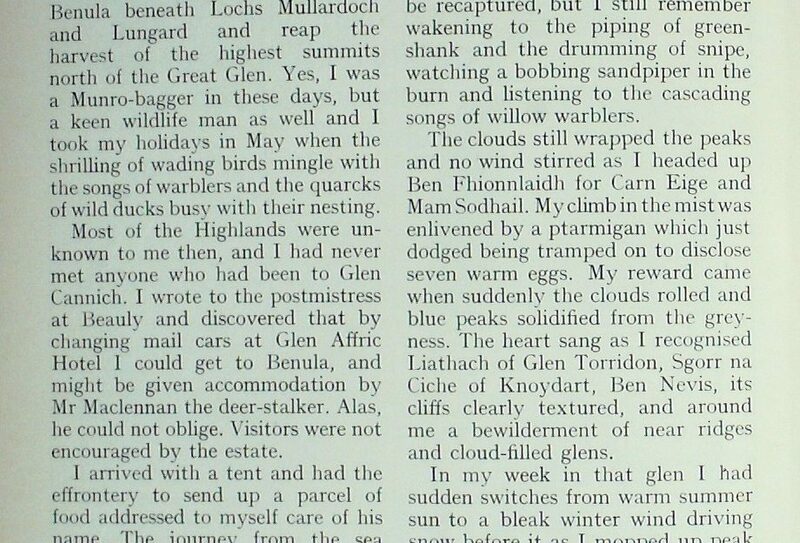 Yes, I was a Munro-bagger in these days, but a keen wildlife man as well and I took my holidays in May when the shrilling of wading birds mingle with the songs of warblers and the quarcks of wild ducks busy with their nesting. 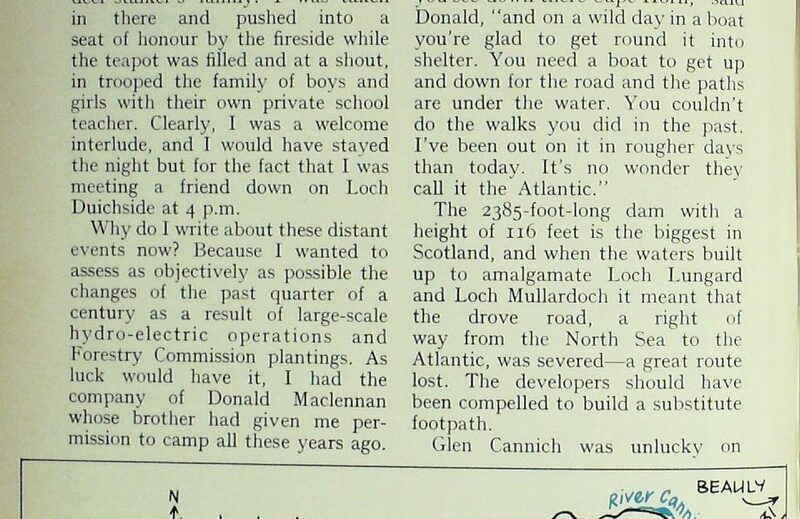 Most of the Highlands were unknown to me then, and I had never met anyone who had been to Glen Cannich. 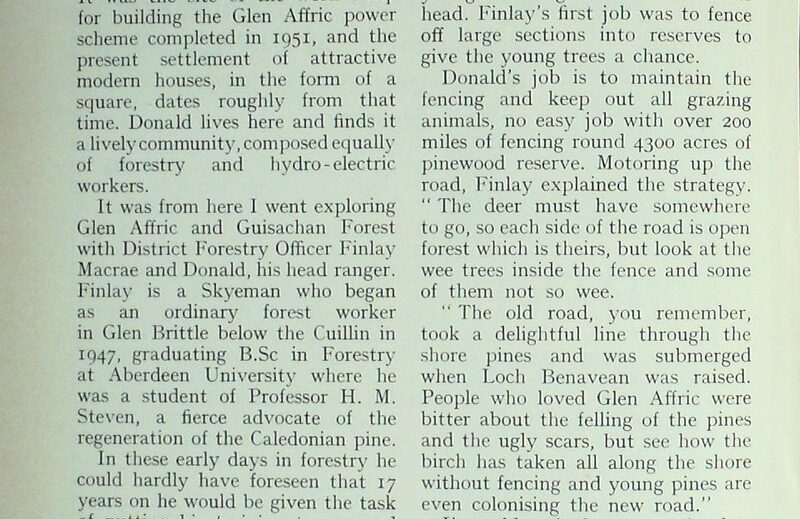 I wrote to the postmistress at Beauly and discovered that by changing mail cars at Glen Affric Hotel I could get to Benula, and might be given accommodation by Mr Maclennan the deer-stalker. Alas, he could not oblige. Visitors were not encouraged by the estate. I arrived with a tent and had the effrontery to send up a parcel of food addressed to myself care of his name. The journey from the sea winding along the tree-clad gorges of the Beauly River and into Strath Glass enchanted me, but it was the sterner stuff I craved, and this came with the changing of mail cars and a rough climbing road. Sun-brilliant birches clustered green in the gullies, and gnarled Caledonian pines spread over the hill shoulders. Loch Mullardoch was grim by comparison, hills hidden in grey clouds and a general impression of coarse peaty shores. At the end of it was Benula Lodge and the keeper’s cottage. The man who came out directed me to a nice little camping place half a mile along the road on the edge of a pine wood. Those days of discovery can never be recaptured, but I still remember wakening to the piping of green-shank and the drumming of snipe, watching a bobbing sandpiper in the burn and listening to the cascading songs of willow warblers. The clouds still wrapped the peaks and no wind stirred as I headed up Ben Fhionnlaidh for Carn Eige and MamSodhail. My climb in the mist was enlivened by a ptarmigan which just dodged being tramped on to disclose seven warm eggs. My reward came when suddenly the clouds rolled and blue peaks solidified from the grey-ness. The heart sang as I recognised Liathach of Glen Torridon, Sgorr na Ciche of Knoydart, Ben Nevis, its cliffs clearly textured, and around me a bewilderment of near ridges and cloud-filled glens. In my week in that glen I had sudden switches from warm summer sun to a bleak winter wind driving snow before it as I mopped up peak after peak as far distant as fabled Sgurr nan Ceathreamhnan—an expedition memorable for the fact that I forgot to pack the substantial piece I had made up, only discovering my oversight when I slung off my pack to have a bite on the summit. Food or no food, I traversed the six tops in what my diary describes as a snow-blizzard high up and rain low down. Soaked, and weak with hunger, I won’t forget the big tightener of soup and eggs and ham I put down when I got back to camp. Nor shall I forget my last day, getting up at 4 a.m. in a downpour and climbing up by Gleann a’ Choilich where the rain changed to snow. At 2,300 feet it was almost impossible to believe the month was May in the driving blizzard as I sought the way down to Glen Affric and the lonely house of Alltbeithe, in those days inhabited by a deer-stalker’s family. I was taken in there and pushed into a seat of honour by the fireside while the teapot was filled and at a shout, in trooped the family of boys and girls with their own private school teacher. Clearly, I was a welcome interlude, and I would have stayed the night but for the fact that I was meeting a friend down on Loch Duichside at 4 p.m.
Why do I write about these distant events now? Because I wanted to assess as objectively as possible the changes of the past quarter of a century as a result of large-scale hydro-electric operations and Forestry Commission plantings. As luck would have it, I had the company of Donald Maclennan whose brother had given me permission to camp all these years ago. Donald was an estate deer-stalker in the early days. Today he is a Forestry Commission ranger, which means his first duty is to the health of the growing trees, whereas before, his interest was with deer as sport! Together, on top of the big concrete dam which blocks the head of Glen Cannich, we contemplated nine miles of windswept reservoir under which lie three shooting lodges and their cottages. The 2385-foot-long dam with a height of 116 feet is the biggest in Scotland, and when the waters built up to amalgamate Loch Lungard and Loch Mullardoch it meant that the drove road, a right of way from the North Sea to the Atlantic, was severed—a great route lost. The developers should have been compelled to build a substitute footpath. Glen Cannich was unlucky on another count. Too many of its Caledonian pines fell to the axe in order to make room for commercial stands of timber. The Forestry Commission have admitted that they made a mistake here. Even so, they have done a fine job, and there is a fine mixture of old and new trees stretching up to the rocky corries, with a rich sprinkling of larch. 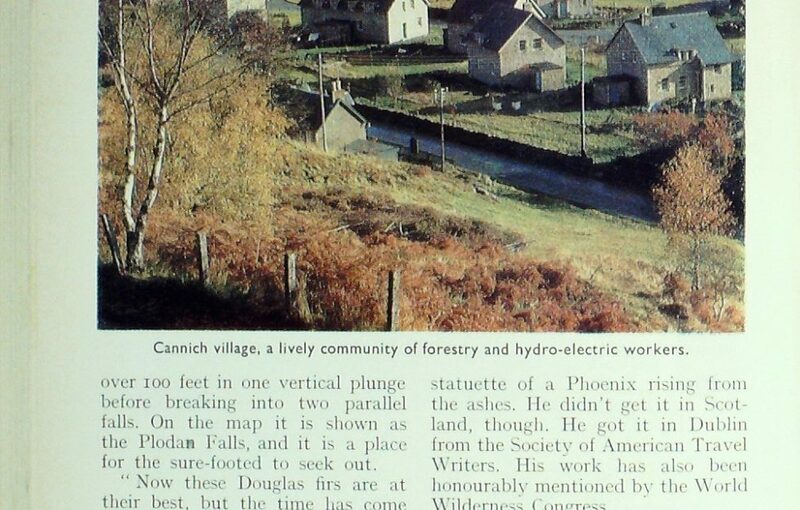 Cannich village, shown in the photograph on page 308 (image 6 in the gallery), didn’t exist when I came the first time. It was the site of the work camp for building the Glen Affric power scheme completed in 1951, and the present settlement of attractive modern houses, in the form of a square, dates roughly from that time. Donald lives here and finds it a lively community, composed equally of forestry and hydro-electric workers. It was from here I went exploring Glen Affric and Guisachan Forest with District Forestry Officer Finlay Macrae and Donald, his head ranger. 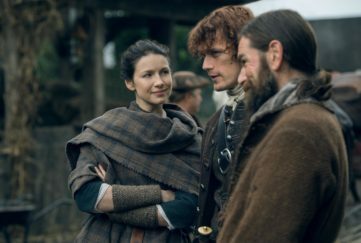 Finlay is a Skyeman who began as an ordinary forest worker in Glen Brittle below the Cuillin in 1947, graduating B.Sc in Forestry at Aberdeen Universitv where he was a student of Professor H. M. Steven, a fierce advocate of the regeneration of the Caledonian pine. 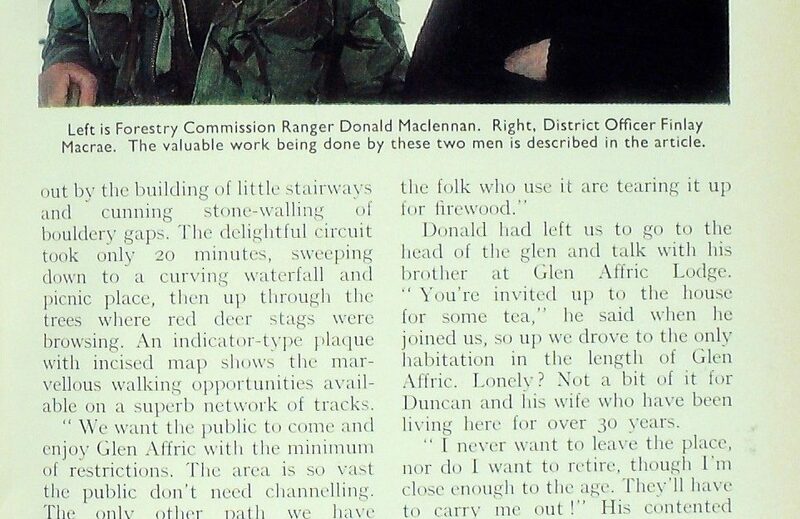 In these early days in forestry he could hardly have foreseen that 17 years on he would be given the task of putting his training to use and undertaking the regeneration of the Caledonian pine woods of Glen Affric from Loch Benavean to Loch Affric in a mountain setting without compare in Scotland. Here was a challenge indeed, for the major loch had been turned into a reservoir with an artificial shore line and the scars of a new road reducing the aesthetic appeal of a hitherto unspoiled gem of wild mountain and loch scenery. True the damage had been kept to a minimum by tunnelling the waters of Loch Mullardoch through the mountains from Glen Cannich thus avoiding pylons and enabling the powerhouse to be put down at Fasnakyle. The existing lines were beautiful to look at, an open forest flowing over the foothills, but they were ancient trees without successors, offering marvellous shelter to sheep and deer which grazed down every young seedling which reared its head. Finlay’s first job was to fence off large sections into reserves to give the young trees a chance. Donald’s job is to maintain the fencing and keep out all grazing animals, no easy job with over 200 miles of fencing round 4300 acres of pinewood reserve. Motoring up the road, Finlay explained the strategy. “The deer must have somewhere to go, so each side of the road is open forest which is theirs, but look at the wee trees inside the fence and some of them not so wee. I’ve seldom had a more stimulating drive as feature after feature of the pinewood reserves was pointed out. Hundreds of trees had grown up from seeds cast by the aged parents, while in other areas hand-planting had been resorted to, where the natural fertility had been degraded by neglect. In some cases chemical fertiliser has been put down to good effect. We parked the car and took the new river walk which has been laid out by the building of little stairways and cunning stone-walling of bouldery gaps. The delightful circuit took only 20 minutes, sweeping down to a curving waterfall and picnic place, then up through the trees where red deer stags were browsing. An indicator-type plaque with incised map shows the marvellous walking opportunities available on a superb network of tracks. 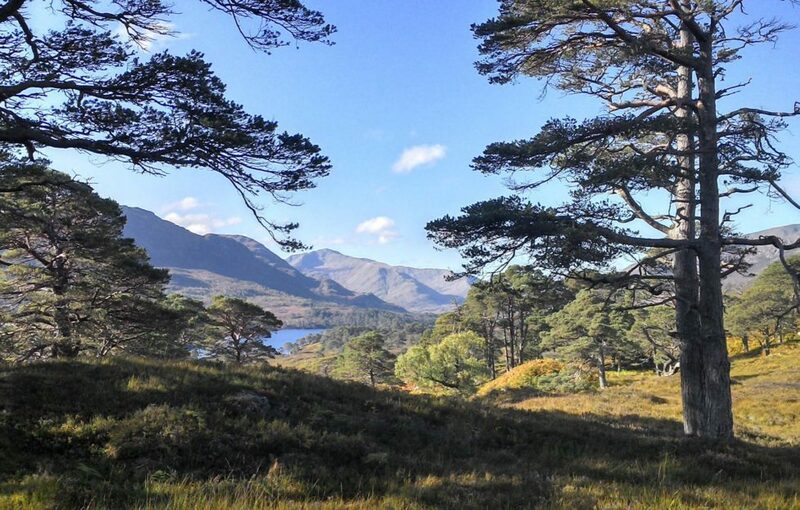 “We want the public to come and enjoy Glen Affric with the minimum of restrictions. The area is so vast the public don’t need channelling. The only other path we have specially laid out is at the Dog Falls at the beginning of the glen, for visitors who want away from the car but don’t want anything too strenuous. “The real back-packer can find their own way. It’s about 15 miles through the hills to Kintail, I did it with my daughter last year and it was pretty tough,” said Finlay. Donald had left us to go to the head of the glen and talk with his brother at Glen Affric Lodge. “You’re invited up to the house for some tea,” he said when he joined us, so up we drove to the only habitation in the length of Glen Affric. Lonely? Not a bit of it for Duncan and his wife who have been living here for over 30 years. “I never want to leave the place, nor do I want to retire, though I’m close enough to the age. They’ll have to carry me out!” His contented wife smiled as she handed us tea and fresh-made scones and pancakes. “The winter passes for us too quickly, for it’s the only time we get to do things for ourselves. Now it’s the lambing and all the outside jobs until the end of the season. Duncan and his two deer-stalker sons are also shepherds, and Donald the forest ranger used to be here, too, so there is a line balance of interests between the old estate and the new owners, especially since Donald still does a bit of deer stalking on adjacent territory for guests of the Forestry Commission. One of the many things I didn’t know about Glen Affric was that until 1947 birch trees were cut for manufacturing into bobbins for the Indian jute mills, an industry which came to an end when that country became independent. Nor did I realise that the village of Tomich, just south of the mouth of the glen, was built as a model hamlet for the great Guisachan House, now a ruin. In fact, when these trees were planted, the sport of stalking deer with the express rifle was about to reach its zenith, with ornate lodges being built in glens all over the Highlands. It was then that many of the roads, paths, bridges and bothies we take for granted were built; the British Empire was secure, wealth created more wealth, and there was no war on the immediate horizon. Fate, however, had something in store for a young man who came here to visit his aunt, wife of the second Lord Tweedmouth. 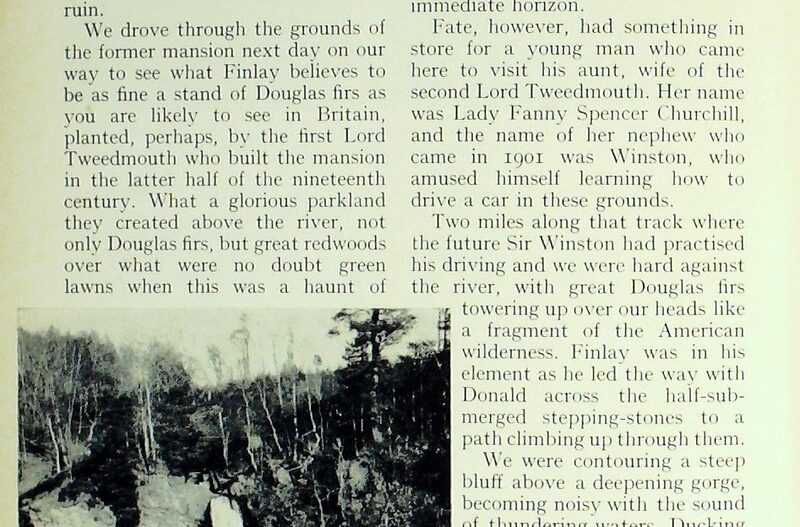 Her name was Lady Fanny Spencer Churchill, and the name of her nephew who came in 1901 was Winston, who amused himself learning how to drive a car in these grounds. Two miles along that track where the future Sir Winston had his driving and we were hard against the river, with great Douglas firs towering up over our heads like a fragment of the American wilderness. Finlay was in his element as he led the way with Donald across the half-submerged stepping-stones to a path climbing up through them. We were contouring a steep bluff above a deepening gorge, becoming noisy with the sound of thundering waters. Ducking under branches and feeling our way, it was not possible to see much until suddenly we were in the clear and facing one of the most glorious waterfalls in Scotland, a great cascading spout of white falling over 100 feet in one vertical plunge before breaking into two parallel falls. On the map it is shown as the Plodan Falls, and it is a place for the sure-footed to seek out. Finlay’s dedication to his native pinewood reserves has now been justly acclaimed with the award of a statuette of a Phoenix rising from the ashes. 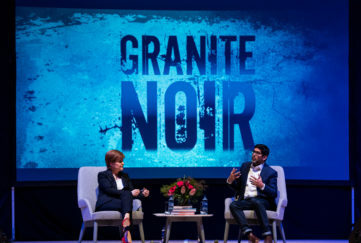 He didn’t get it in Scotland, though. He got it in Dublin from the Society of American Travel Writers. His work has also been honourably mentioned by the World Wilderness Congress. High praise must be given to the Forestry Commission, too, for giving the right man his chance to do one of the most worthwhile things I have seen done in my lifetime. In Scotland there are 35 locations of true Caledonian forest remaining. Over a score in private hands are on deer forest and have no future unless fenced. Now owners are being encouraged by a grant of £225 per hectare if they will undertake conservation. I sincerely hope they respond. Thankfully, the Alltbeithe Youth Hostel was saved from closure and is still going strong. The website for making reservations can be found here. Restoration of the Caledonian Forest in Glen Affric was taken on to great success by Alan Watson Featherstone, founder of Trees For Life. We interviewed him for our January 2016 issue – an extract of which you can see here. It is gratifying to look back on Tom’s piece today, and realise how much has since been achieved to return the glens to their natural beauty, and reverse the damage caused by the hydro-electric operations and early badly-judged planting. A fact of which Tom would no doubt be proud. Read more from Tom Weir’s archives next Friday. 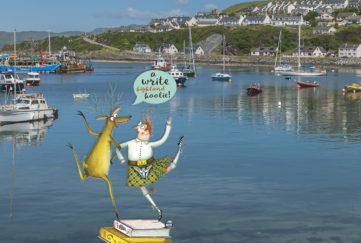 We have an extensive archives of Tom Weir’s great columns for The Scots Magazine, and we’re slowly but surely getting them published digitally for new generations to enjoy.